We are loose and in control. We are comfortable and soft. We can seduce and draw a line..
We are you, in so many ways. Together we are 49.6% of the people in the world. 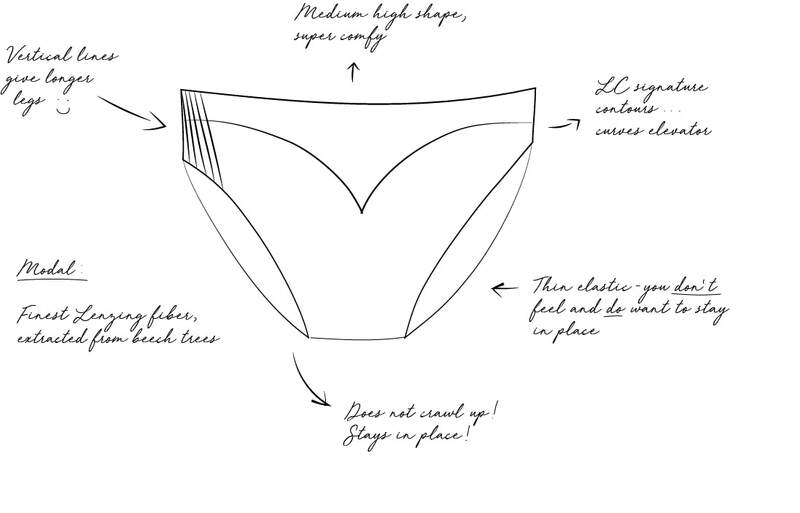 ​Exclusive designs that define feminine contours and bring shape to basic underwear. My idea for “Les Culottes” was born on the ocean side in a little African village, during a one-year road trip with my family. It is inspired by the desire for comfortable underwear with playful and exclusive patterns. It is dedicated to the women of the now: modern day nomads with a lust for life, who constantly seek new adventures while being surrounded by style and comfort. The cut is specifically created for an impeccable fit with an elasticity that holds it in place but does not bother. The first collection is called 'Les Voyageurs’; each piece has geometrical compositions with a unique blueprint. They are delightful landscapes inspired by my journey: countless sunsets over the oceans, overwhelming mountain views, star constellations, and the hundreds of roads travelled. Les Culottes are handmade and printed individually, making each piece unique. They are crafted in Italy of the finest Lenzing Modal®, a fiber extracted from sustainable beech trees. It's durable, soft as silk and it breathes. ​It just slips on! 100% handmade & individually printed underwear, made in Italy from the finest Lenzing Modal®. Les Culottes have been a collaboration with Laura Hersée, Amsterdam based designer, illustrator and dear friend. ​Do take a look at her website and instagram page.